The Hudson School Health and Safety Advisory Committee had its first meeting of the school year this past Tuesday. Among important topics, the committee had a presentation by Jason Verhoosky, Director of Wayland Cares (substance abuse prevention coalition) on Recreational Marijuana Education and Prevention. The presentation included an explanation of the new marijuana regulations, forms of marijuana products, and the use of marijuana through vaping and edibles. All forms of vaping use have become an area of extreme concern, particularly among teenagers. The District’s legal counsel released an advisory this week alerting of us of the upcoming changes to law regarding student use of tobacco that reads: “In July 2018, the Massachusetts Legislature passed “An Act Protecting Youth from the Health Risks of Tobacco and Nicotine Addiction” to reduce youth access and use of tobacco and nicotine products, including vaporizers. The legislation impacts individuals, businesses, government agencies, as well as educational institutions and it goes into effect on December 31, 2018. The new definition encompasses vaping and electronic tobacco products, and therefore prohibits student use of those products on school grounds. It also includes “any component, part or accessory of a tobacco product,” meaning that students may not use tobacco products, such as vaporizers, even if they do not actually contain tobacco, including if they are empty”. Although regulatory measures provide guidance to policies and procedures, it does not affect change in prevention and education. Disciplining students for possession and use of tobacco products in school reflects reactive measures of a symptom that does not address the deeper problem. Prevention and education should lead the efforts and it cannot be limited to school personnel and health professionals. We need a full coalition of stakeholders with parents/guardians at the center. Young adults have easy access to tobacco products and families need to be the first line of defense in monitoring students’ access and consumption of these products. We will succeed if we work together in educating our students on the danger of tobacco use. Enjoy the long weekend and THANK a Veteran for all the sacrifices they have endured to make us free! 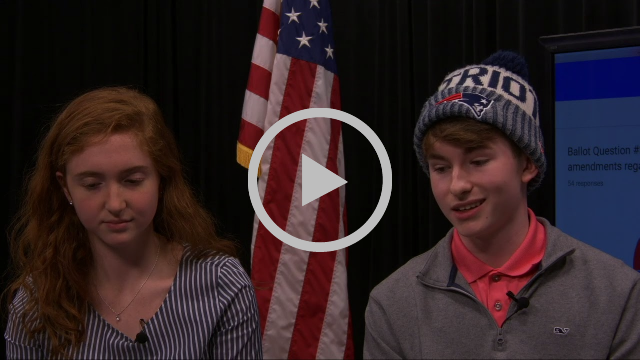 On Monday, November 5, Hudson High School AP Government students conducted a mock election. Campaigning and voting occurred at all three lunches where students and staff were given the opportunity to vote for their favorite candidates at the federal and state levels. On Wednesday, following the elections, the students compared the mock results with their predictions and that of the general election. Quinn Middle School Newspaper Club - Read All About It! "Newspaper Club meets every Monday. It takes place in Mrs. Hoff’s room. In Newspaper Club, you write articles and interview different people at Quinn. There have been articles about teachers, students’ preferences, school activities, etc. Newspaper Club is a fun way to interact with people while practicing journalism. All of the kids in Newspaper Club absolutely love it. Students of all grades are involved." On Thursday, November 8, students from Hudson High School's Advanced Theater Studies class performed a short play that they wrote for students at Forest Avenue Elementary School. The play was an origami skit with messages about being a good citizen in support of the Forest Avenue Leaves of Citizenship program. The Hudson Public Schools is launching the search for the Principal’s position at Hudson High School. The District has developed a search process document that outlines all of the events and timelines associated with the search. This document is also available in Portuguese and Spanish. The District will seek input from parents, community members, school staff, and students through focus groups and surveys. The District will also seek volunteers to participate in the interview panel. The focus group for parents and community members has been scheduled for Wednesday, November 14th, from 6:30 p.m. to 8:00 p.m. at Hudson High School in Room F101. A survey will be launched on Monday, November 26th. We will ensure that stakeholders receive a link to the survey through social media, e-mails, School Messenger, and posting on the District’s website. This morning, students, staff and families from the Joseph L. Mulready School participated in their annual Veterans Day Assembly. 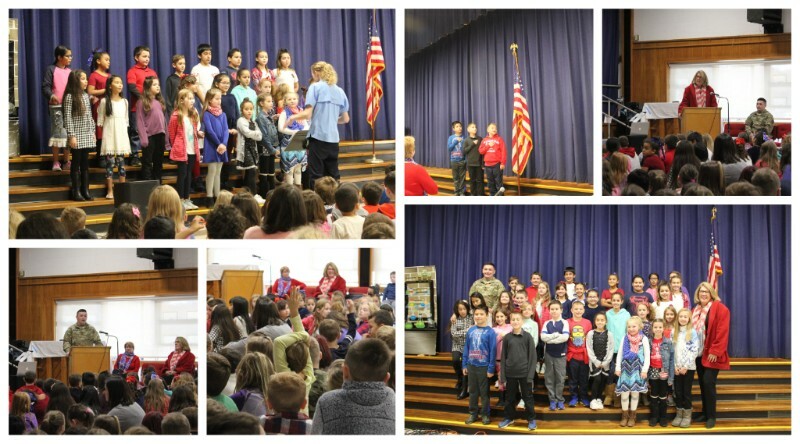 Students learned about the history of Veterans Day (formerly Armistice Day) while listening to songs, poems and guest speakers Representative Kate Hogan and Army Specialist Nick Mobilia. The spirit of patriotism was alive and well amongst students today. Join us in thanking a veteran this Veterans Day. Last Thursday, Hudson High School physics students hosted their annual Haunted Physics Lab for students and families. the Haunted Physics Lab attracted almost 250 visitors to Hudson High School looking for spooks and sparks. Students in AP Physics 2, aided by student volunteers from other physics classes at Hudson High, organized the event. It featured a total of 17 stations that immersed children and adults in the wonders of mechanics and electricity. They twirled and whirled in the Rotating Chair, stepped inside a Faraday cage, and dug their hands into non-Newtonian fluids, among many other experiences. New City Microcreamery topped off the evening with free samples of their ice cream, made on the spot and kept cold with liquid nitrogen. We wish to send a special thank you to Alyssa, and the folks at New City Microcreamery, for demonstrating how they use liquid nitrogen to make their ice cream. This week, school counselors at Hudson High School presented Break Free From Depression to students in Grade 9 Wellness Classes. Break Free from Depression is a program that educates teens about depression and mental health. The program consists of three classroom lessons, a brief film, and guided group discussions. It is an education program to increase students’ knowledge of depression, their confidence in identifying signs and symptoms related to depression, and their ability to access resources. Nearly two million American adolescents suffer from depression each year, and up to three-quarters of these individuals will not be diagnosed and will not receive treatment. Left untreated, depression can lead to deteriorating school performance, strained relationships with peers and adults, high rates of absenteeism, school dropouts, and substance abuse. Their goal is for students to have accurate information on depression, be equipped with tools to readily identify signs and symptoms of depression in adolescents, as well as have the skills to access resources and supports in the school and community. Did you know that on Monday, November 19 at 7:30 p.m. there will be a Special Town Meeting in the Hudson High School Auditorium? The Articles on the Special Town Meeting Warrant are as follows: ARTICLE 1 Establish Department of Public Works Capital Stabilization Fund, ARTICLE 2 Transfers to Department of Public Works Capital Stabilization Fund, ARTICLE 3 Appropriation from Receipts Reserved, ARTICLE 4 Rescind Borrowing Authorization, ARTICLE 5 Deed in Lieu of Taxes – 47 Apsley Street, ARTICLE 6 Community Preservation Appropriation of Funds, ARTICLE 7 Amend Zoning Map - Adaptive Reuse District – 71 Apsley Street, ARTICLE 8 Amend Zoning Map – C-1 Zoning District, ARTICLE 9 Amend Zoning By-Laws: Marijuana Overlay District, ARTICLE 10 Stabilization Fund appropriation. Sunday, November 11 - Town of Hudson Veterans Day Ceremony - Hudson High School Band to perform. 10:00 a.m. Hudson Town Hall, 78 Main Street. Guest Speakers: Rep. Kate Hogan, Sen. James Eldridge, Selectmen John Parent, Keynote Speaker: Eileen Gelsomini, author of "Courage and Faith". Tuesday, November 13 - Hudson School Committee Meeting - 7:00 p.m., 155 Apsley Street. Tuesday, November 15 - SEPAC Hudson - ADHD Presentation with Brendan Mahan, M.ED., M.A. of ADHD Essentials - 7:00 p.m., Hudson High School, Rm F101, 69 Brigham St Hudson MA. Free and open to the public. Wednesday, November 14 - Hudson High School Principal Search Focus Group - 6:30 - 8:00 p.m., Hudson High School, Room F101, 69 Brigham Street.